As my books and posts probably make obvious, I spend a lot of time perusing ladies’ magazines from the early 1800s. For the blog, I may choose a fashion because it’s bizarre. Or it may be because it’s a year I haven’t done for a while. In this case, I chose because I liked the dresses, the art, and the grace of the poses. 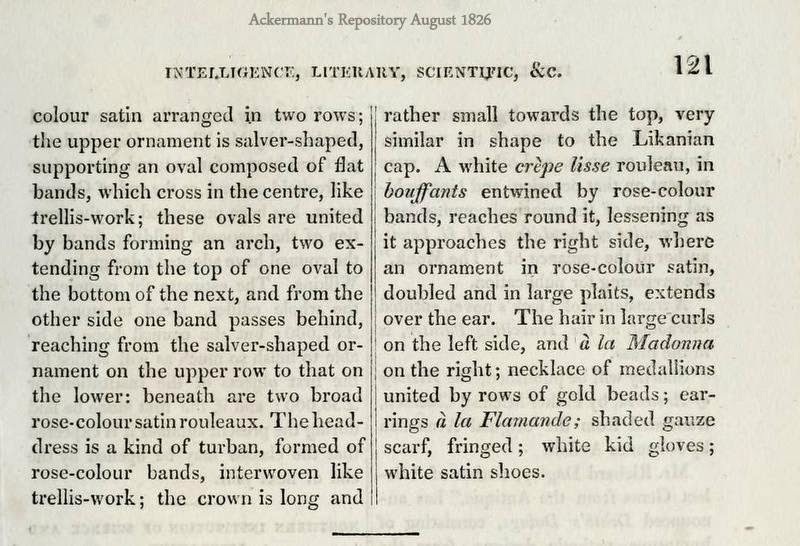 Fashion was getting more structured in the 1820s, yet these plates manage to look airy, somehow. 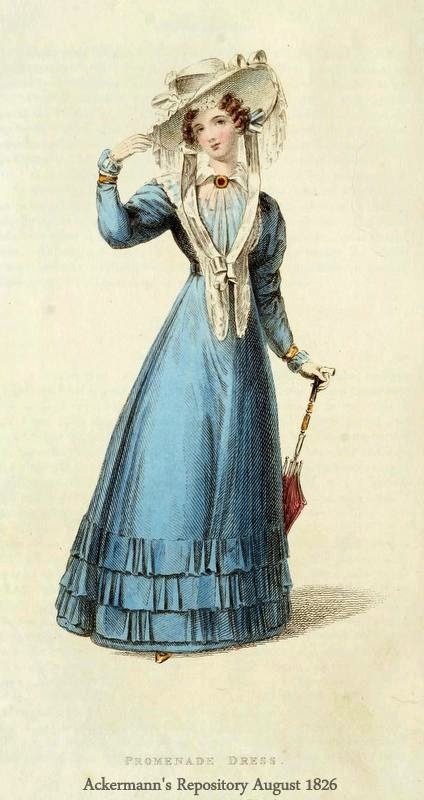 The pelerine on the blue dress looks like a fall of lace rather than the stiffer little cape one sees in the 1830s. I can’t decide which is my favorite, though. What about you? Clicking on the image will enlarge it. Clicking on the caption will take you to the online source, where you can enlarge further. My apologies for the weird placement. Blogger limits my flexibility with images. That promenade dress is lovely. Both dresses look surprisingly comfortable, although the waists look like a size not found in nature without corsets. I'm surprised women didn't drop like flies wearing the later corsets to hours long events. Have you noticed that all the fashion dresses are presented on mature models. The ladies shown wearing the gowns in all the ones I have seen from the 1790's on, are women who one can assume are married and mothers of children. They are not young women trying to entice men but women who are married with a decent dress allowance. 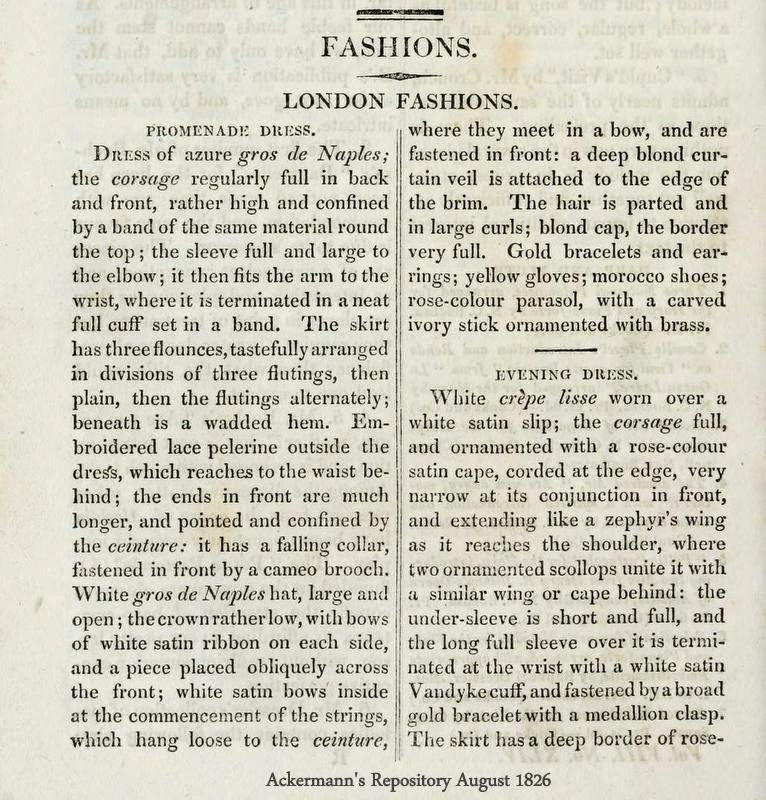 Some of the regency fashions shown in magazines look as though the women are wearing a metal bra. Love the blue, the whole ensemble from the hat, the hair, the dress and the pelerine. Where do you find magazines from the 1800's? The decoration on the skirt of the evening gown look like stylized pineapples. Or maybe I've just spent too much time on the colonial era. Karen Anne, the plates are very stylized. Paintings are a little more reliable, although they, too, tend to idealize and stylize. In fact, corsets from this time still can't be laced really tightly, because they don't yet have metal grommets. 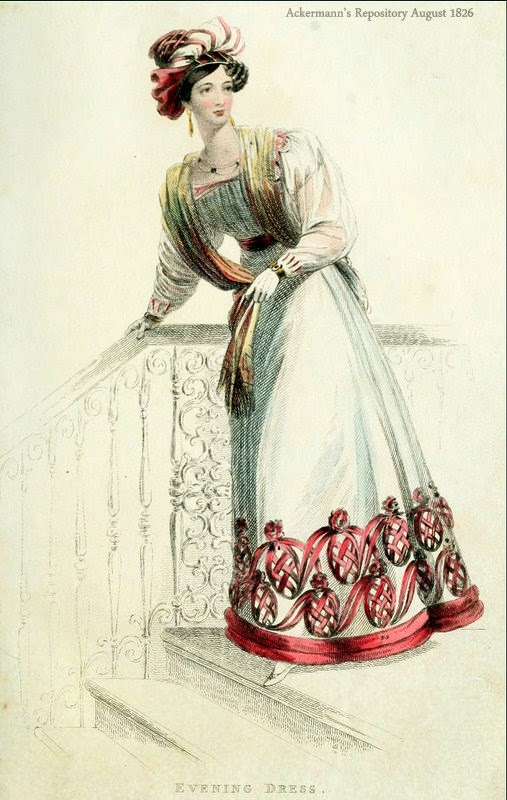 Regency Researcher, I do believe the fashion plates were aimed at married women, although the English weren't as strict about unmarried women dressing more or less like nuns (as in France--pale colors, simple styles, hair pulled back like ballerinas.) I agree that some look more mature than others, possibly depending on the artist. And the magazine. La Belle Assemblee's ladies look pretty young in some prints. Too, a "matron" could be eighteen years old or younger (like Lydia Bennett. 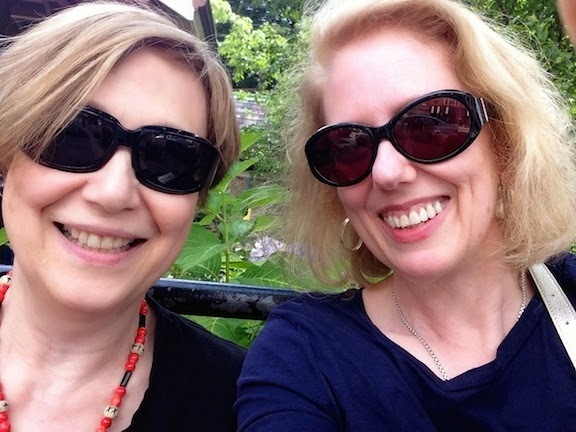 Kathleen, I include links to the online editions of the magazines in my post. Just click and you can look to your heart's content! In my latest book, you'll find tons of bad (OK, there's some good) poetry culled from the magazines.